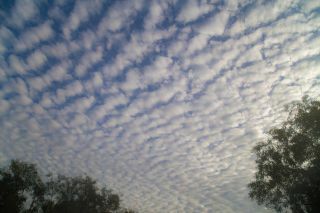 This is a picture of stratocumulus clouds. But clouds are important. They dye a wide swath of the atmosphere white, as seen from space, reflecting sunlight away from Earth's surface. And stratocumulus clouds are an important part of that picture; they're those white blankets you might have seen as you looked out the window of an airplane, rolling out below you and hiding the ground. Researchers suspect that certain sudden, past jumps in temperature may have been caused by changes to clouds like these. For the new research, scientists modeled just a small patch of sky using a supercomputer. They found that if carbon dioxide (CO2) levels reach about 1,200 parts per million (ppm) in the atmosphere, stratocumulus clouds break up. That's a very high carbon dioxide concentration. Right now, levels have climbed past 410 ppm — already a dangerous shift from the 280 ppm that prevailed before the industrial revolution. But humans put more and more CO2 into the atmosphere every year. If current trends continue, Earth could reach 1,200 ppm within 100 to 150 years. This could happen if our society doesn't follow through on any of its commitments to reduce emissions, Wolchover reported. And even if it does, the result would be another 14 degrees Fahrenheit (8 degrees Celsius) of heat added to the global average, on top of the dangerous changes already underway due to greenhouse gases. That's an enormous change, and it goes beyond predictions of worldwide ice melt and catastrophic sea-level rise. The last time our planet was that warm, crocodiles swam in the Arctic and the region around the equator was "scorched" and "mostly lifeless," according to Wolchover. And once the stratocumulus clouds are gone, Wolchover reported, they likely wouldn't reappear until atmospheric carbon dioxide levels dropped below where they are currently. There's still some uncertainty in the data, however; and it hasn't been replicated. The 1,200-ppm figure could shift up or down as scientists look into the issue further. But whether or not humans kill off stratocumulus clouds or not, this study highlights the many factors in climate change we don't yet understand.